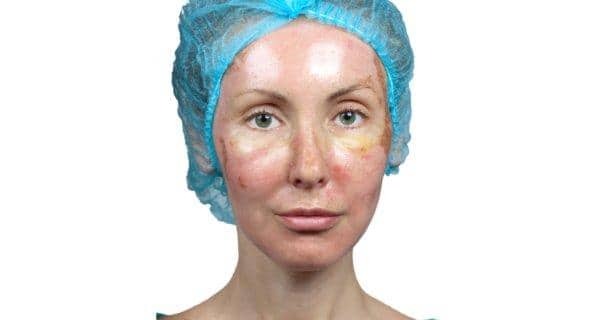 Rosacea is a chronic disease in which the skin of the face predominate causing facial redness, visible blood vessels, small raised spots (papules), boiled (pustules) and swelling. Very often, it can be confused with sunburn acne o. It is characterized by flares and remissions. Psychological, social and occupational significant impact because of the appearance can cause potentially harmful. Women between the ages of 30 and 60 and fair-skinned people are more likely to develop rosacea. In rosacea, the blood vessels of the face can dilate very easily. Increased blood makes the skin appear red and flushed. However, the exact cause of rosacea is unknown. microscopic mites (Demodex infestation) are a natural part of the human body that live in the hair follicles on the face and eyelids. A study supports the presence of these t increased density in the skin and also associated with Helicobacter pylori infection of the gut with rosacea. Error in the immune system has also been associated with rosacea in some studies. Cathelicidin production, an antimicrobial agent is strongly increased in rosacea. Evidence also suggests that rosacea may be inherited. Some of the most common triggers for rosacea include sun exposure, emotional stress, alcohol, spicy foods, hot foods or drinks, hot or cold, extreme temperatures, vigorous exercise, hot baths, etc. Rosacea usually begins after age 30. One of the first signs is redness of the face and sometimes on the ears, neck, etc., with periods of remission and lighting. The redness may resemble a blush or sunburn. Over time small bumps (papules) or pus-filled pimples (pustules) that resemble acne can develop and visible blood vessels may appear on the face. The course of rosacea is variable and unpredictable. If left untreated, the signs and symptoms become increasingly severe. It can affect the nose and eyes as well. The nose can be enlarged and bumpy accumulation of excess tissue. This, more common in men, a condition known as rhinophyma. Rosacea can affect the eyes and cause repeated attacks of blepharitis . The eyes are watery or open them appearance. irritation and burning sensation in the eyes may occur and eyelids may be swollen. This is called ocular rosacea. Styes are common too. How is rosacea diagnosed? Can it be cured? The diagnosis of rosacea is based on signs and symptoms and medical history. Other conditions with signs and symptoms such as acne, psoriasis, etc. Similar can be discarded. Rosacea is not a cure. But the signs and symptoms of rosacea can be controlled with medication. Treatment can be tailored based on the signs and symptoms of an individual. If left untreated, rosacea can worsen over time. How can you manage rosacea? Avoiding triggers, the practice of skin care and following prescribed long-term medication can help successfully manage rosacea. Rosacea is characterized by flares and remissions. oral and topical medications can be prescribed to reduce facial and for the treatment of scabies redness and pimples. Antibiotics Rosacea help treat the inflammatory and anti-production inhibiting action cathelicidin. To reduce extensive redness and to eliminate visible blood vessels laser treatments can be used. Once the condition improves topical medications can be used to maintain remission. skin thickening and scaling around the nose may require surgery to remove excess tissue and re-contour the nose. ocular rosacea can be treated with oral antibiotics and other therapy. The treatment of ocular rosacea may include artificial tears, cleaning the area around the eye with warm water and antibiotics. for more articles on diseases visit our Diseases and Conditions section . For free daily health tips, subscribe to our bulletin . 1. Holmes AD. The potential of microorganisms in the pathogenesis of rosacea paper. J Am Acad Dermatol. 2013 Dec; 69 (6): 1025-1032. doi: 10.1016 / j.jaad.2013.08.006. Epub 2013 September 5. PubMed PMID: 24011460. 2. Cribier B. [pathophysiology of rosacea]. Ann Dermatol Venereol. 2014 Sep; 141 Suppl 2: S158-64. doi: 10.1016 / S0151-9638 (14) 70153-X. French. PubMed PMID: 25151931. 3. Palatsi R, NS Kelhälä, Hägg P. [New insights into the pathogenesis and treatment of rosacea]. Duodecim. 2012; 128 (22): 2327-35. Review. Finnish. PubMed PMID: 23342479. 4. T. Jansen clinics and classification of rosacea presentations. Ann Dermatol Venereol. 2011 Nov; 138 Suppl 3: S192-200. doi: 10.1016 / S0151-9638 (11) 70089-8. PubMed PMID: 22183098.